FORMER GARDA COMMISSIONER Martin Callinan has told the Disclosures Tribunal that Fianna Fáil TD John McGuinness has told “falsehoods” over an infamous car park meeting in January 2014. Callinan said that the claim that he said Maurice McCabe had sexual abused members of his family is not true “in any shape or form”. The former commissioner was giving evidence for a second day at Dublin Castle this morning, where he faced questions over claims he ordered a smear campaign against McCabe and also said negative things about the whistleblower to a number of different people. He was asked about evidence already given by a number of different individuals to the effect that he said negative things about McCabe to them. Callinan was asked this morning about allegations made by Fine Gael TD John Deasy. 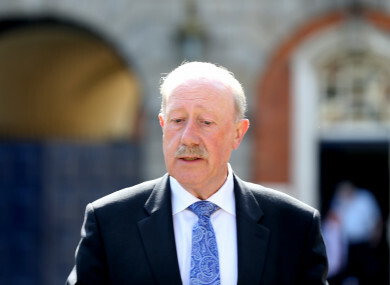 Deasy has told the Tribunal that – prior to the infamous PAC hearing in January 2014 where Callinan used the word “disgusting” on whistleblowers – that Callinan spoke to him beforehand and said that Maurice McCabe was someone “that could not be believed or trusted”. The claims of the Comptroller and Auditor General were also put to Callinan. Seamus McCarthy has told the Tribunal that Callinan “made statements to the effect that McCabe was not to be trusted, that he had questions to answer, and that there were allegations of sexual offences against him”. Again, Callinan denied saying this. He said that he did discuss Maurice McCabe but he thinks “there was some sort of misunderstanding” over what the Comptroller and Auditor General recollects of the conversation, and suggested that he is “mistaken”. Callinan also said that it was McCarthy who raised the issue of the 2006 allegation of sexual abuse against Maurice McCabe. It’s McCarthy’s case that Callinan brought it up and had said McCabe had “questions to answer”. Now at the time, the matter was investigated and McCabe was exonerated of wrongdoing. But Callinan told the Tribunal today that McCarthy indicated he’d heard a “story or rumour” about the allegation. The former commissioner said that he then “corrected the record” and told the Comptroller and Auditor General that a file had been prepared by the DPP who directed no prosecution. Another account that Callinan is totally at odds with is that of former PAC Chairman, and Fianna Fáil TD John McGuinness. The TD has told the Tribunal that, after that same PAC meeting in January 2014, Callinan told a negative story about garda whistleblower John Wilson and then made a remark about “the other fella fiddles with kids”, which McGuinness took to mean McCabe. Callinan gave a different version of events. He told the Tribunal today that he asked McGuinness the question of if Wilson would be called to give evidence. Callinan said the reply was: “You must be joking. He’s an effing header.” He went on to say that his version is the “correct” one and no other version is correct. The very next day, Callinan arranged to meet with McGuinness in the car park of Bewley’s Hotel in west Dublin. It’s his assertion that he wanted to express his worries on data protection and other matters that would arise if Maurice McCabe gave evidence at PAC the following week. McGuinness has told the Tribunal that Callinan told him that McCabe had sexually abused members of his family, and that there were allegations still against him. The former garda commissioner robustly denied ever saying this, telling the Tribunal: “That is absolutely false. I never under any circumstances said anything of that nature. There is no room for misinterpretation of what was said. These are outrageously serious allegations made against me. I cannot for the life of me understand why they have been made. They’re not true in any shape or form. They’re falsehoods. The Tribunal continues with further evidence from Callinan this afternoon. Email “Callinan says that TD's claim he said McCabe sexually abused family members is a 'falsehood'”. Feedback on “Callinan says that TD's claim he said McCabe sexually abused family members is a 'falsehood'”.